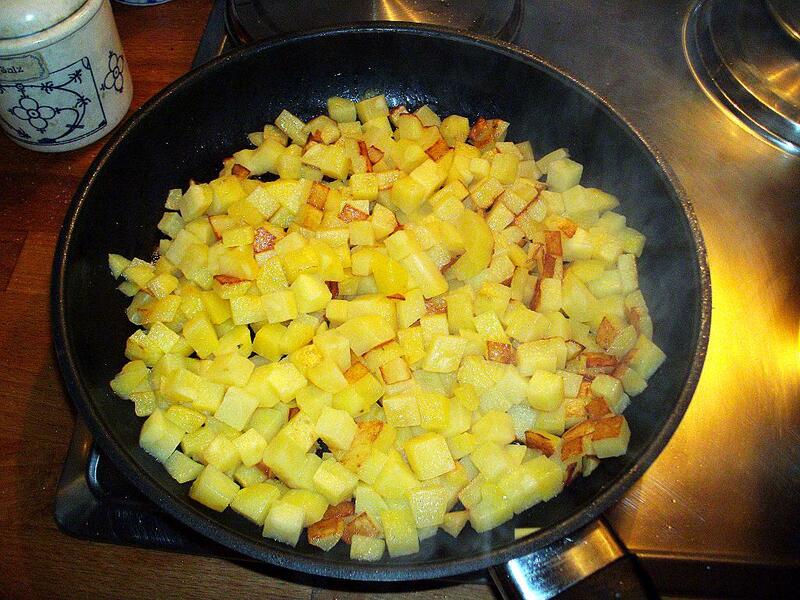 Put the dry (do not wash the dices) potato dices in a medium hot, oiled Polytetrafluoroethylene(PTFE)-coated pan. 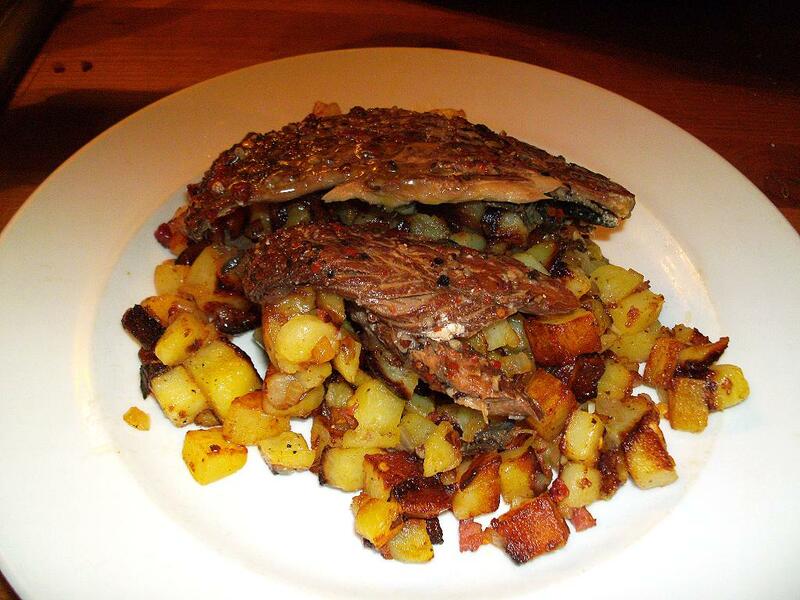 Let the potatoes roast two or three minutes before you can say that you like the colour and the crispness. Try not to get distracted too much; reading Slashdot comments might be a bad idea. It will nevertheless need about twenty minutes depending on the size of the dices. 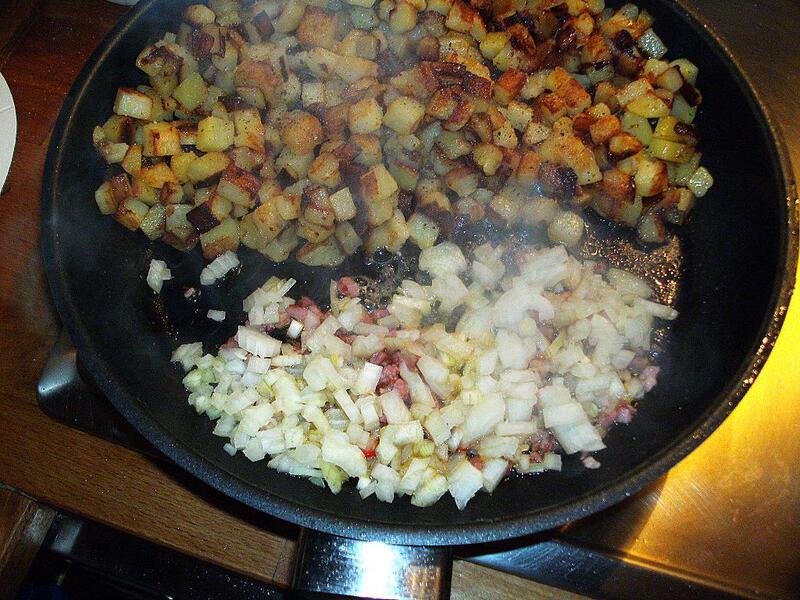 The potatoes need to be fully cooked before you can add more of the ingredients. Prepare these ingredients in the meantime. Instead of reading Slashdot. 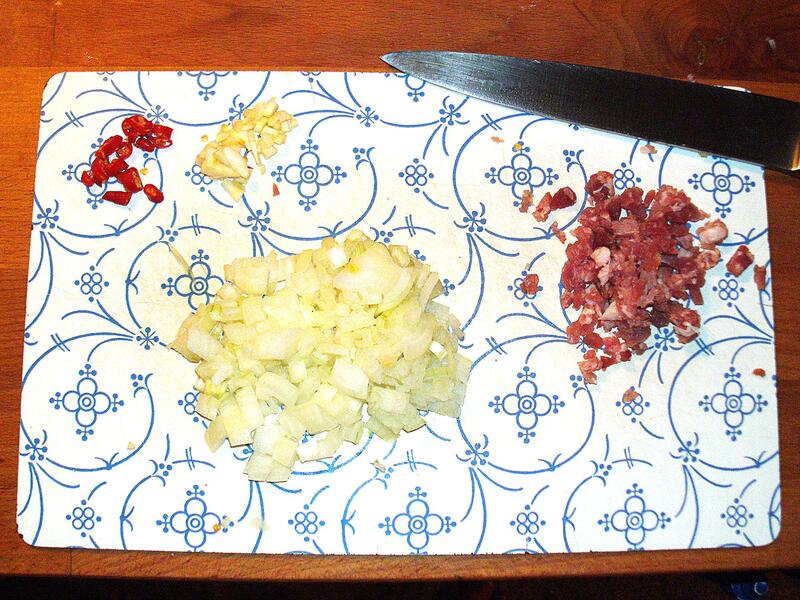 Slice them and dice them and finally: chop them finely. 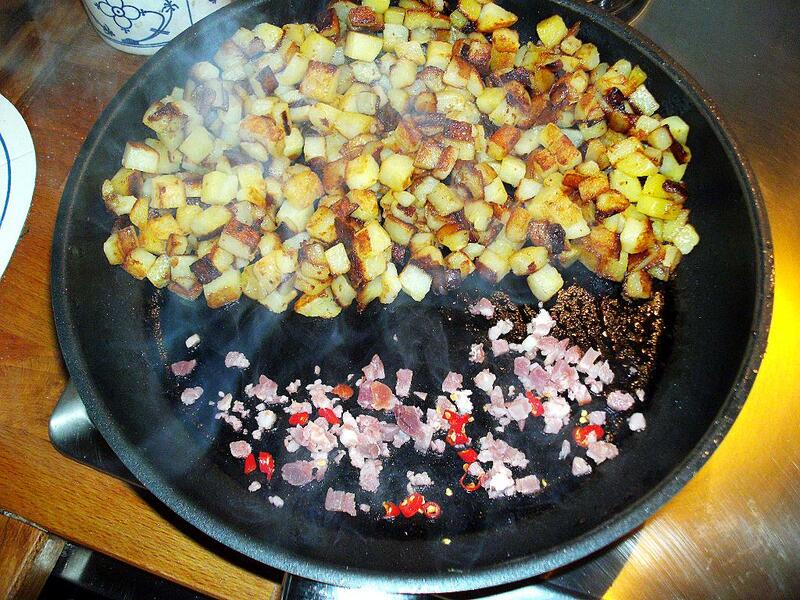 Make some room in the pan and place the chillies and the ham/bacon/tofu there. Let it go for some seconds. 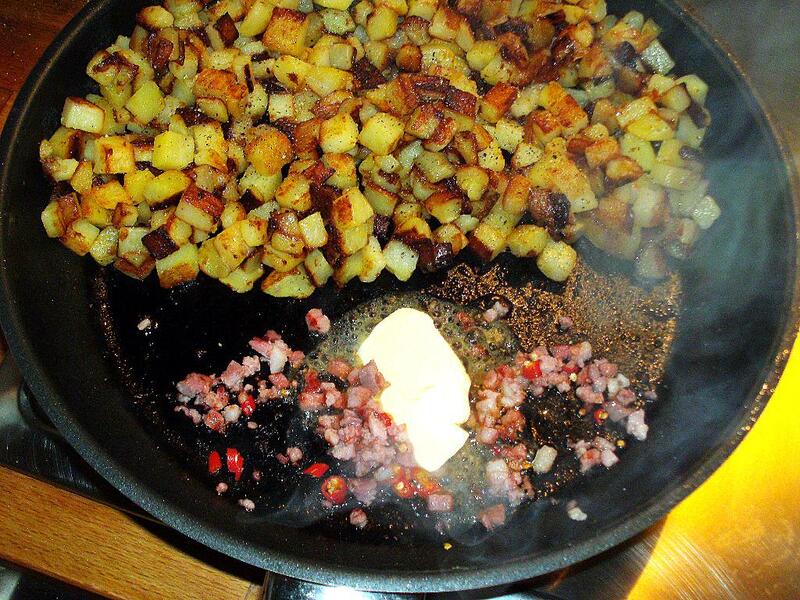 If the ham/bacon has not enough fat or is unwilling to let it go fast enough add a drip of oil or two. If you really want to use the tofu: it will need a drip of oil or it burns and gets quite a nasty taste. Also, it will not taste very good if burned. 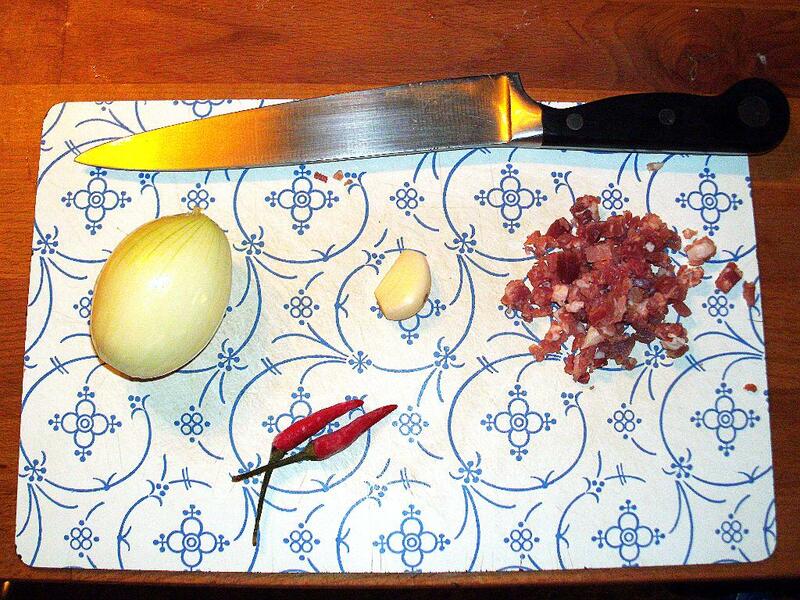 Don’t waste any time and hurry to add the onion! Switch on the exhaust hood! Let them go until they are transparent. Let it go for some seconds. 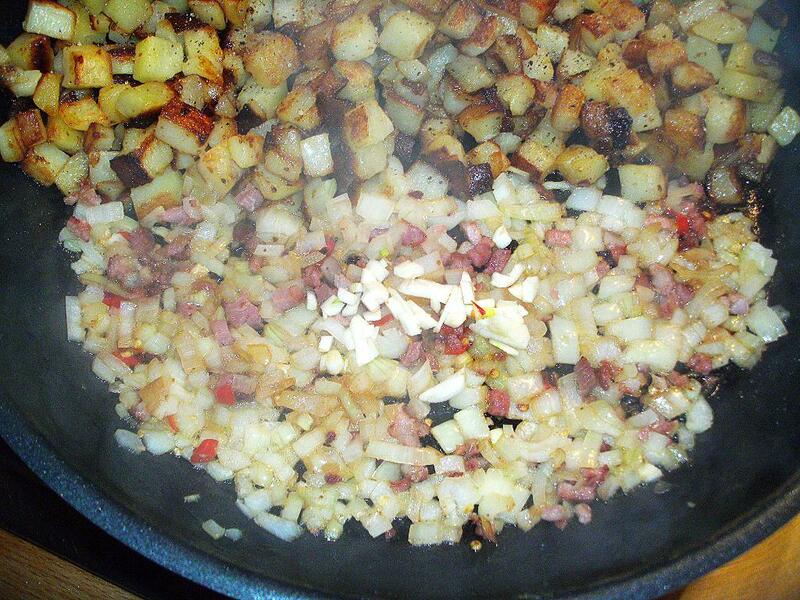 Add the herbs (which are still amiss and nobody wants to admit to have taken them. Grrr! 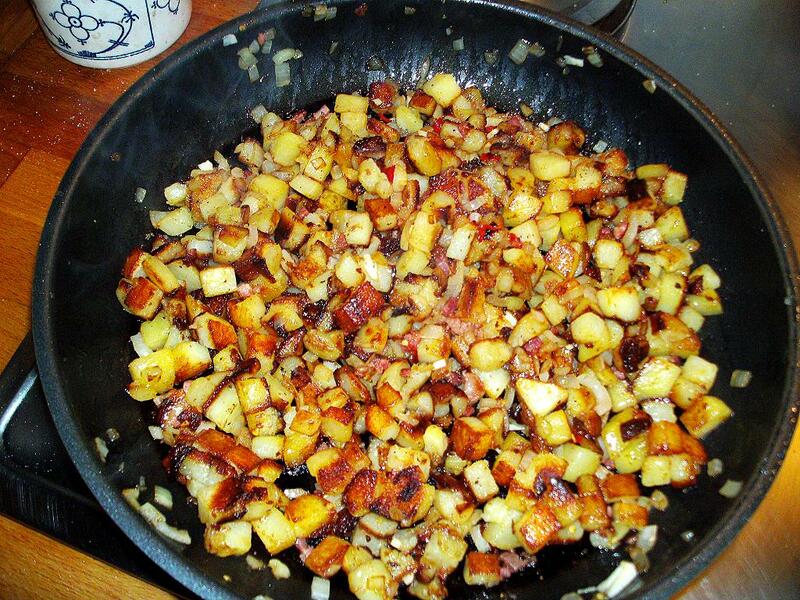 ), salt and black pepper and mix it all. Mix it, Ba…uhm…no, won’t say that. The ugly thing on top is a mackerel, filleted and boned, roasted, densely lined with pepper-berries (black, green and the red variant which is not a real pepper botanically as far as I know) and cured for some days in a bit of thin pickle, just enough to cover the filets. I will give an illustrated recipe the next time I do it again. 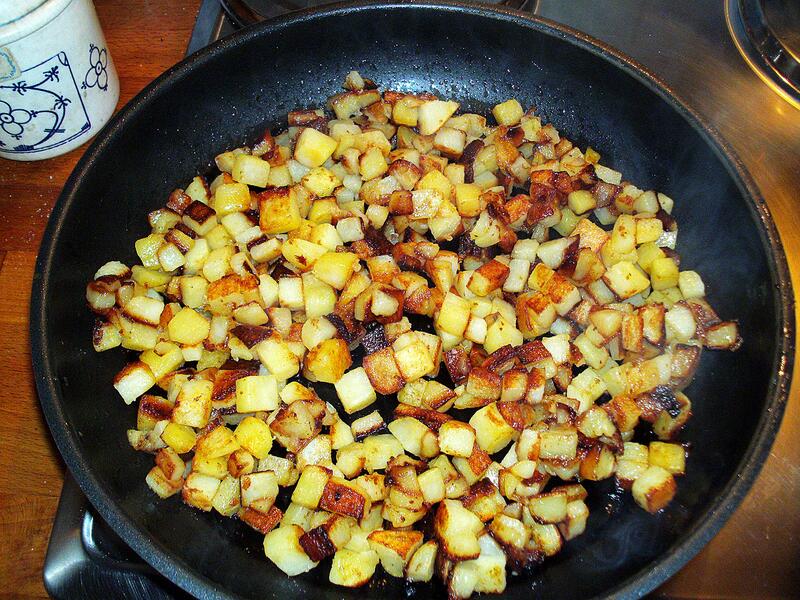 Hi – Thanks for recommending a pan with Teflon® nonstick coating for your Home Fries recipe. I represent DuPont and it’s always a pleasure to see people recommending our products. It is nice, Sara, to see some companies choose a little hint instead of the large hammer others do prefer, so I did not hesitate to change my blog entry according to your unspoken wish.